A collaborative project led in part by the University of Oregon's Oregon Institute of Marine Biology was among 20 public-private partnerships recognized by U.S. Secretary of the Interior Sally Jewell when 2013 Partners in Conservation Awards were presented earlier this year in Washington, D.C. The awards – selected from among hundreds funded by the Department of the Interior – recognize innovative conservation projects that involve collaboration between federal agencies, public research universities and private research institutions to protect and preserve natural resources. More than 260 universities, organizations and individuals played roles in the 20 award-winning partnerships. The OIMB was part of a consortium of 17 institutions—including the Bureau of Ocean Energy Management, the National Oceanic and Atmospheric Administration, the U.S. Geological Survey, the Woods Hole Oceanographic Institution and 11 other research universities from both sides of the Atlantic—that worked together surveying and exploring diverse biological communities in the Atlantic Ocean's deep-water canyons. Several University of Oregon faculty members, graduate students and postdoctoral researchers were involved in the project, including Craig Young, director of the OIMB; Maya Watts, a postdoctoral researcher at OIMB who coordinated the project for the UO; and Sandra Brooke, a former postdoctoral researcher and guest faculty member at the UO who is now an associate research faculty member at Florida State University. Brooke represented the UO at the ceremony is Washington, D.C. The deep-water canyo ns team used a remotely operated vehicle (ROV) known as JASON to explore the abundant coral habitats in the canyons located off the mid-Atlantic outer continental shelf, including one formation surrounding what may be the largest methane gas seep yet discovered. Cold-water methane seeps occur over fissures caused by tectonic activity along the sea floor and provide nourishment and habitat for large communities of deep-sea mussels and coral. In addition to the biological and oceanographic discoveries, the team also conducted research into historic shipwrecks and the biological communities they support. OIMB provided the principal support for identifying animals during the research expedition and will continue to support samples of deep-water mussels and coral in its Oregon labs. 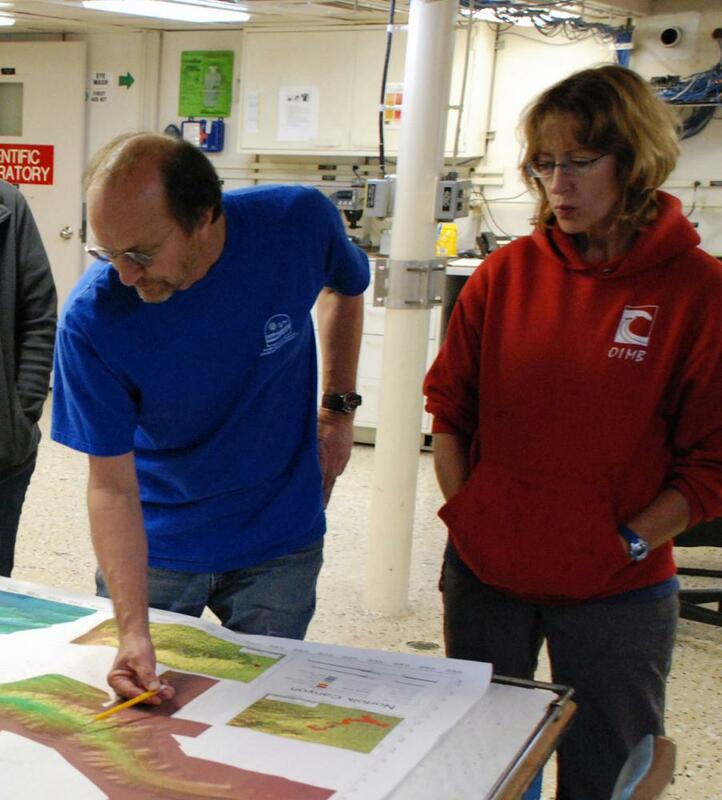 More information about the OIMB and the Deepwater Canyons team is available on NOAA's “Deepwater Canyons: Pathways to the Abyss” website.